No matter how big your rig, truth is the RV kitchen is no match for the one you have back home. But that’s just part of the fun! But before you hit the camping stores in search of 10-in-one utensils to start stocking up the RV kitchen, take a look around and see where you might be able to maximize space—and see what you own already that could do double (or even triple!) duty. You might even want to jot down the essential utensils you use at home during a regular week of cooking and take it from there. If you’re new to roadtripping or in need of an overhaul, these travel tips are for you! This is a less-is-more scenario—and think “nesting.” Buying pieces from a single collection helps, as most times they’re created to work with each other. There’s no way you can recreate your home kitchen in your camper—there just isn’t the space! Here is a sample of a list of some basic pots as a starting point. Plastic may be lighter, but truth is, glass is easier to clean, doesn’t stain and doesn’t hold on to old cooking odors. Buy microwave safe containers—they come in a wide variety of sizes and most have snap-on lids that are great for storing food in the refrigerator. Plastic is great for dry goods such as pasta, rice and cereal. You can find narrow containers that easily fit in tight spaces, and be sure to label them clearly so you don’t have to go hunting to see what’s in where. And don’t forget to take along a variety of Ziploc bags—they take up very little space and have endless uses. Take your RV kitchen for a test drive. Go for a long weekend away and see how your supplies and space work out. You’ll probably find you’re missing something, so take along a pad and pencil! Don’t spend more money than you have to. Though we recommend keeping your RV kitchen stocked on its own, separately from your home kitchen, there’s no need to hit the specialty stores and rack up a large bill. Big box stores like Walmart and Target have great kitchen sections, and you’ll find many of the things you need at discount stores like Marshall’s Home Goods, TJ Maxx and Ross. 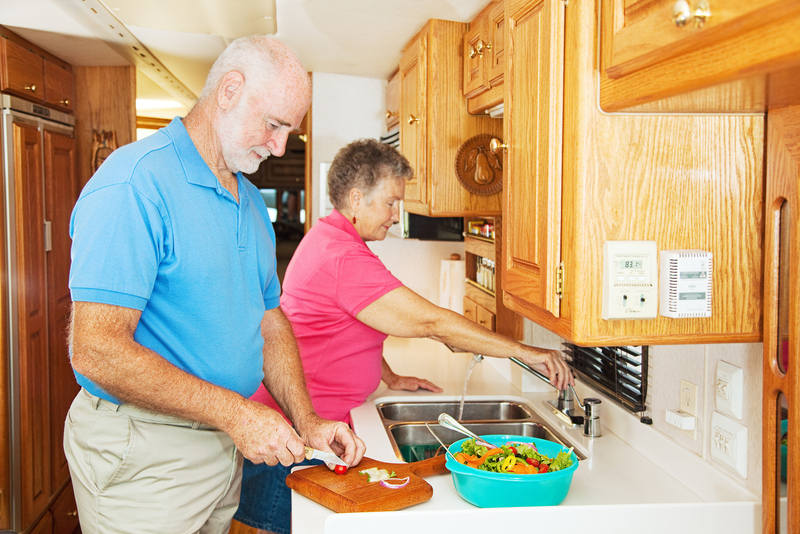 Check your kitchen, too: chances are you have doubles of things you can move to your RV and save some cash. Measure all your accouterments before you leave. Meaning, you might want to make sure your pans fit in the stove and/or microwave and everything has a place and space for when you’re literally driving down the road. If you buy glass, don’t forget to wrap it in clean towels before you hit the road to avoid chipping and breaking. Have any tips for stocking up the RV kitchen? Add them in the comments below!